The question for me arose as I was finishing up a painting one day. The painting had not been commissioned, and I wondered whether it had value. “Why am I doing this?” “What value does my depictions of nature bring to this world?” “Why is what I am doing worthy?” "Or is it?" And as I reviewed my purpose as an artist I came to the following conclusions: first, I paint wildlife because I have a sense of wonder and it force me to study more closely the beauty that I find in nature, and secondly, I paint very specifically to proclaim that beauty to others. Virtually every one of my paintings is composed in very specific ways to direct the viewer’s eyes in a direction that I want them to go and to produce a visceral or emotional connectedess to the subject matter. Well so what, what if beauty itself has no value? That’s a shocking thought to an artist. Artists like me tend to believe that their purpose in the world is to stand as a sort of a guardian and advocate of beauty. If beauty has no value, than the artist has no value. So you see, to an artist, beauty is everything – it’s what we think about everyday. It is certainly what I think about everyday. It is also what I wish that others would notice everyday. That is the artist’s job and that is why I produce nature art. When I use the word “beauty,” I use it in a broader sense than simply visual beauty. The definition that I like is sort of a combination of definitions you will find in the various dictionaries: "beauty" is that quality or combination of qualities that produce pleasure or satisfaction to the human mind. It can arise from sensory stimuli such as color or light or form or sound or movement or taste, from rhythms or patterns, and even from interactions between people or things which stimulate high emotional or spiritual qualities. It seems to be an essential quality of humanness. While we can differ on what each of us may consider beautiful, the constant is that everyone understands the concept. Certainly there are times when beauty is in the eye of the beholder, but beauty always exists – even though it may be difficult to see amongst the practical distractions of our everyday lives. In analyzing beauty's purpose, I think it is instructive to consider what our world be like without it? In 2014, NASA discovered a planet they named Kepler 186f – the first earth sized planet discovered in the habitable zone of another star. Many scientists believe that somewhere, someday, we will find life of some sort on another planet, it is only a matter of time, and I tend to agree. Habitable is defined as a planet where liquid water could pool on its surface, but there are many other concerns for sustaining life as well: temperature, radiation, composition of the atmosphere etcetera. But, I have yet to see as one of the defining necessities for life on another planet, that the planet be “beautiful.” Why is that? Because beauty does not seem to be essential for life. Scientists speculate that, based on the nature of Kepler 186f’s star, that light on that planet would have an intensity only about one third of our brilliant sun. That the visible light would be skewed dramatically toward the infrared, creating a more monochromatic world, and that plant leaves would tend toward the color black in order to absorb enough energy to achieve photosynthesis. Not exactly what we would consider beautiful. My point is that our recent discoveries provide us some real theoretical scientific evidence that life without what we know as beauty is actually quite feasible. I suppose we could live quite comfortably as well here on earth without beauty. But such a world would certainly be without what we would describe as “joy” wouldn’t it. There would be no happiness, exhilaration or love which beauty tends to elicit. There could certainly be other things that would exist on Kepler 186f like ugliness, evil, poverty, suffering, hatred etcetera – just as they exist here on earth – but the beneficial consequences of beauty would not exist. Without beauty the beneficent side of our humanness could not be, at least not as we know it. So why does beauty exist? I believe beauty exists for one essential reason. Without it, the concept we call “love,” and its accompanying sense of belonging are not possible. Have you ever noticed that the synonym for beauty is “lovely?” The suffix “-ly” meaning: "having qualities of, or appropriate to," the concept of love. Beauty is not the equivalent of love, I believe beauty to be the primary fundamental basis of love, without which, love cannot exist. Without beauty there is no love, and without love, there is no sense of belonging. Think about that for a moment. Isn’t everything we find beautiful love-ly? It is often a matter of degree, but I think you’ll agree that at a minimum, “beauty” and “love” certainly have a codependent relationship. Human beings certainly exist on a plain above the simple physiological needs of food, shelter and safety which scientists may be looking for when searching for life on other planets. On planet earth, humans undeniably require a sense of love and belonging to thrive. How else do you explain the phenomenon of Facebook? I’m quite certain that when Mark Zuckerberg created Facebook at Harvard, that he had no idea of the intensity of the need for human connectedness that caused Facebook to explode across the world to over a billion monthly users. And why is that? The vast majority of facebook posts are little expressions of beauty, sharing a parent’s joy, a beautiful picture, an interesting milestone, a video that provokes laughter or emotional concern, a moment of gratitude in a person’s life –such as a delicious plate of food in a new locale. When I look up at the beauty of the stars, or look out at a beautiful sunset, or look down at the incredible complexity of a leaf I feel a sense of what I call love and connectedness. We all do. When I notice the care in an act of kindness of a stranger – such as the care exhibited by firefighters on 9/11 – I am connected to that firefighter – if only through a visual depiction on the television and my emotions. And for me that connectedness is essential to my existence. Without beauty, none of that is possible. Without beauty we are all just life forms living on Kepler 186f in a logical and emotionless world. Every day we can turn on the TV and see pain and strife and ugliness and destruction – but that is not the world which we were given, the world that we were given is actually quite ordered and beautiful. Spiders weave beautiful webs, crows collect shiny objects, birds use their beautiful plummage in mating rituals and familial groups are critical for many animals, but in many ways human beings seem to have a need for beauty and belonging that goes beyond the similar needs of most other creatures. Because of that, I also believe that beauty exists not exclusively for us, but specifically for us – for human beings – for you and for me. It is a specific gift which enables each of us, if we choose, to thrive, not just individually but as a species. We can choose to embrace and nurture it, or disregard it - as we all too often do. My reactions to a lovely spring day, sitting quietly in the woods, the smell of gardenias, the cheerful yellow of a daisy and my interactions with others all give me a sense of belonging. It reassures me that in some way we are all connected in some sort of earthly soul - that I belong and am the recipient of an enormous gift. My art is an expression of gratitude for that gift. 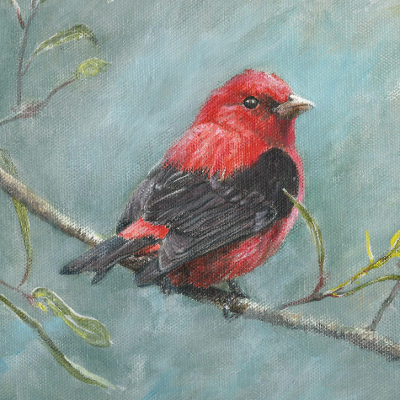 I paint wildlife to train myself to see beauty in all natural things and attempt to convey that beauty to others. That is the artist’s role and that is why the arts are so vitally important. If we fail to seek, recognize and give gratitude for the beauty on our daily lives then we risk exchanging joy for sadness and gratitude for frustration. We can’t experience love if we fail to recognize beauty. That is why beauty is important, that is why it exists and that’s why it is important for us to wake up everyday and recognize the immense and infinite gift of beauty that surrounds us.